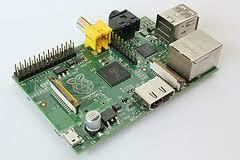 What is a Raspberry Pi ? : - The RPi is a small ARM GNU/Linux computer for about AUD$40. The RPi has a PLL onboard which locks to a multiple of the onboard clock (26MHz) producing frequencies up to 250 MHz. This signal is accessible on an output pin as an approximately 3Vp-p square wave which, after filtering, can be use as a software controlled transmitting source. The software binary and source code to do this is available here. This software implements the WSPR mode and the credits for this code is given there. NOTE: - The following implementation is an adaption of the base code developed by others as given in the credits. I did not write the RPi WSPR code - but have adapted it. The first project was to simply familiarise myself with the RPi and succeed in getting the WSPR code loaded and working. I had to learn from scratch about UNIX and how to get the code into the RP as well as change the source and re-compile. I also had to hack the code a bit to compensate for the particular crystal frequency on the RP to get the correct TX frequency and also adjust the sync timing to get DT=0 +/-0.4. The output waveform is a square wave so it needs a LPF before connecting to any sort of antenna. In my case the signal is fed directly to a Class D amplifier which produces a square wave itself. The output of that amplifier is lowpass-filtered. Note also you need to be the holder of an Amateur Radio Licence appropriate for your country for the band you operate on. First use was on the 630M Band. More details can be found in these post on my 630M Activity Blog. The second project was to examine the WSPR code and see if it could be adapted to produce a JASON mode signal. I had to study the WSPR code and change the source to work in JASON mode and re-compile. To determine how JASON implements my IFK technique I transmitted using the I2PHD JASON software and noted the tones shifts for each character. After a bit of head scratching I figured out an algorithm for converting the ASCII codes of the characters into two successive tone shifts. First use was again on the 630M Band. More details can be found in these posts on my 630M Activity Blog.